The use of surgery to correct defects of the eye is not new to the medical practice and has in fact been carried out for decades. With each year that passes, ophthalmologists discover better ways of operating on the eyes with reduced risks and side effects. In recent times, the eye surgery method that gained mainstream acceptance and popularity has been the use of laser for eye surgery. However, research has discovered a new eye surgery which might be more effective than laser surgery with fewer side effects. What is New Eye Surgery? When it comes to the treatment of the eye defect known as short sightedness or myopia, laser eye surgery has been the preferred means. However, this form of eye surgery has not been without its risks and though the success rate is said to be very high, there are some patients that have suffered from worsened eyesight after the surgery. The major problem with laser surgery is that it is not reversible. To combat this, a different method of treating short sightedness was found which involved placing an artificial lens into the eye and is called phakic intraocular lens surgery. It works particularly well for those who are not well suited to laser surgery. The side effect associated with this new eye surgery is that patients who have been treated using this method are quite likely to develop cataracts later in life, although this can easily be treated through an operation. The old lens would be removed and a new one put in place during this surgery. Once this surgery has been recommended for a patient, the first step would be an examination of the eye to ensure that it is healthy and can undergo surgery. As a matter of fact, this examination is conducted even before the decision to go ahead with the surgery is set in stone. A few weeks before the surgery, the ophthalmologist might find it necessary to schedule a laser iridotomy, which is to get the eyes ready for the insertion of the phakic lens. Anaesthetic drops might be used before the surgery begins. 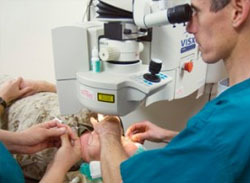 During the operation, the surgeon places a lens over the patient’s eye and makes a small incision in the outer edge of the patient’s iris after which the phakic lens is inserted. The entire procedure takes no more than a few minutes and is an outpatient operation. Several instructions for the care of the eye will be given by the surgeon after the procedure and they should be followed religiously. Some steroid drops would be prescribed which should be used for a certain number of days after the surgery. Antibiotic drops may also be prescribed to prevent infection. Slight discomfort might be experienced immediately after the operation, which might last for a few days. However, there should be no severe pain after the surgery and if there is, the patient should contact the ophthalmologist immediately. This form of surgery is still pretty much a new one so the cost is going to depend largely on the surgeon. However, an average of £2,000 per eye should be expected. It is highly doubtful whether this would be covered by the NHS although you can always speak to your GP and enquire before asking about private surgeries.